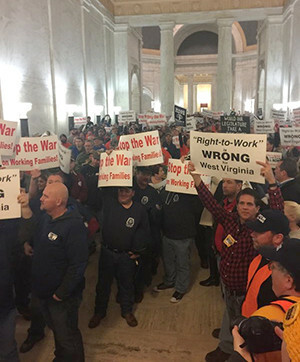 Charleston, W.Va. — Over 1,000 workers, union staff and their supporters showed up at a West Virginia AFL-CIO demonstration in the state Capitol rotunda on Jan. 13 to display their collective anger and opposition to proposed “right-to-work” (for less!) legislation, which is to be introduced this session. If passed, West Virginia would become the 26th RTW state. While the House is firmly in the hands of the Republicans, there is controversy in the Senate. Daniel Hall was a Democrat when elected to the Senate in 2012 but switched parties in 2014, giving the Republicans the Senate majority and breaking a 17-17 tie. However, earlier this month Hall resigned to take a job at the National Rifle Association. The controversy is over whether a Democrat or Republican should be appointed to his seat. ​If a Democrat is appointed, neither party will have a majority. The state’s Supreme Court of Appeals will hear the case. 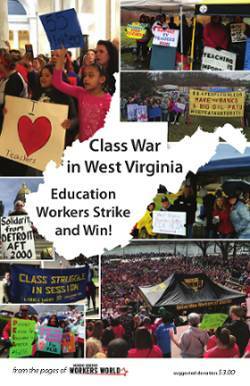 RTW is not the only attack being leveled against the working class in West Virginia. There is also a bill to repeal the “prevailing wage” law. This law requires contractors on state-funded construction projects of $500,000 or more to pay roughly union scale wages, using wage rates calculated by WorkForce West Virginia that are based on surveys of more than 3,700 contractors conducted this summer. Workers and supporters raised slogans such as “Stop the war on working families” and “Right-to-work is wrong for WV.” One organization stood out as a clear left flank in the demonstration. The Appalachian Workers Alliance dropped banners from the rotunda saying, “Beat back RTW! Say NO to Jim Crow!” AWA members were quick to educate people on the racist origins of RTW in Jim Crow segregation in the South. Vance Muse (1890-1950) was a business owner and conservative lobbyist from Texas who invented the “right-to-work” movement against the unionization of workers and helped pass the first anti-union laws in Texas. Muse was editor of the Christian American newspaper and worked for the Southern Committee to Uphold the Constitution, which used both anti-Semitic and anti-Black rhetoric in its lobbying against the re-election of President Franklin D. Roosevelt. The Christian American Association was on the far right wing in Texas labor politics. Muse also used segregationist views as an argument against unions, stating in the most vile language that white workers would be forced into organizations with Black workers or lose their jobs. A union-community fightback is needed to defeat this reactionary offensive. Workers have to understand that the threat of direct, coordinated and collective action is what made unions work in the first place. Their power has always frightened the bosses and the state. Michigan and Wisconsin have shown that the union officialdom and Democrats were outmaneuvered in the struggle against RTW. The worst thing the working class can do at this juncture is to simply look forward to the next election cycle with hopes they can get RTW overturned. What are needed are People’s Assemblies to organize and educate workers on how to win wage increases and safety measures and to raise their consciousness. The working class must come to see that they are the sole producers of society’s wealth and can direct the economy collectively without the need of the private profit motive of capitalism. To do this takes the greatest amount of working-class solidarity and must unite low-wage and part-time workers, as well as the unemployed, Black/Brown/Native workers, students and youth. For more information, see appalachianworkersalliance.weebly.com or call 304-314-4340.